Raider Fans are the Best! 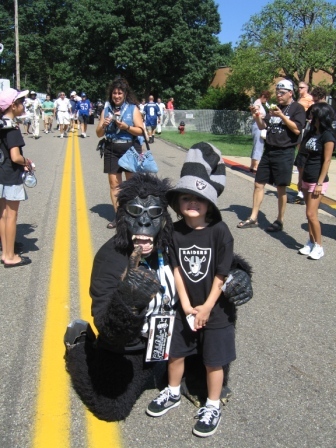 Famous Raider Fan Gorilla Rilla and me at the Pro Football Hall of Fame. ~ by Rod on April 10, 2008. Hey!!! Who are these two monkeys? Hey that gorilla looks a little like the man in the middle of the first picture. This entry was posted on April 10, 2008 at 10:53 am and is filed under Raider Fans.You can follow any responses to this entry through the RSS 2.0 feed.You can leave a response, or trackback from your own site. Next: Me and My Boys!